Dr. Tauer knuckle-taps the door, steps inside, and sits on a low stool; knees touch knees, warm hands cover cold hands. Other than having cancer, I think. I appreciate his compassion, but I just want to get on with things. I want to go home. I zero in on his Brooks Brothers tie, dotted in navy, knotted even and tidy. “Love your tie,” I say, as he glances at my life on his computer. I bring my face close to the bathroom mirror. My eyebrows are my best feature: low maintenance, nicely arched, no rogue hairs, no sparse areas to fill in like old ladies do with unsteady hands, drawing wobbly, thick lines in Maybelline black. Faint lines radiate from the skin around my eyes. I smile and the lines squint and deepen, but they aren’t too bad. Given the circumstances, I’m looking pretty good. A woman’s neck gives away her age, but mine is still smooth with just a little droop under the chin. Nothing that a dab of moisturizer won’t hide. I raise my shoulders, take a deep breath, and pick up the expensive hair brush I bought a couple of months ago at a salon. I attack my scalp, brushing hard. Harder. Thin strands gather in the bristles. After dividing my hair into sections, I pull each section taut, cut 2-3 inches, moving from section to section. Angry, curt scissors clip, blade against blonde. Swatches drop in the sink. Laying the scissors aside, I inspect my work in the mirror. I look like Cate Blanchett when she played Queen Elizabeth and chopped off her hair. “Honey, I’m through with the preliminaries,” I call to my husband, Tom. “Just wait ‘til you see step one to a hair-free life.” I put my hands over my face and peek through my fingers as he walks into the bathroom. Dropping my hands, I burrow my face into his chest. Leaning over the sink, I stare at the shiny drain stopper. My husband guides his whirring beard trimmer over my scalp. Dark stubble from my roots scatters on creamy porcelain. I hope my head is a pretty shape, without too many knots. Daddy always called me a knot-head. The whirring stops. I raise my head and look up at Tom. His eyes are edged with tears. I crawl into bed shy and tentative, like a bride on her wedding night. Will my lover touch me? Will I please him? Even though the rest of my body is covered with cotton and lace, baldness imparts a feeling of nakedness. I turn on my side away from him, clutching the corner of our quilt, trembling. He pulls me in close and strokes my bare head as he would if my blond tresses were spilling over his hands. 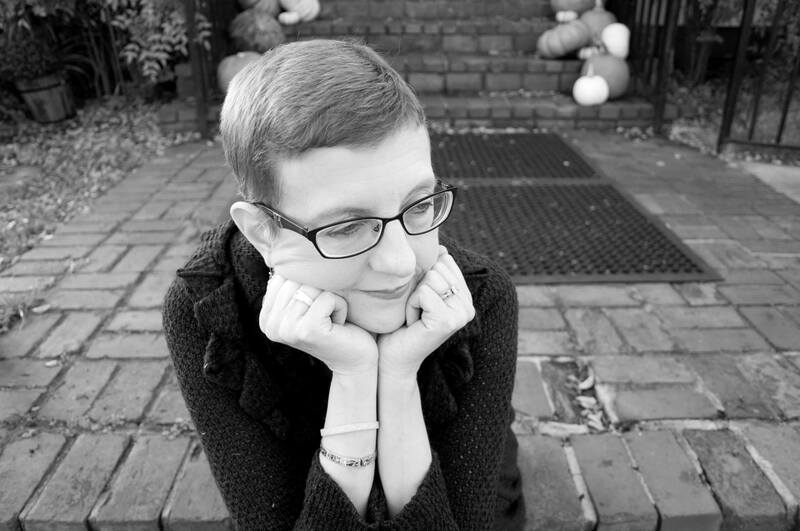 I sit around a table with five other women going through various stages of cancer treatment. Scarves, wigs, and hats reflect our individuality. I’ve arrived bald, sparkly earrings dangling, wearing a peasant top reminiscent of the sixties, embracing a bit of a rebellious spirit I had secretly wanted when I was younger. We talk about how we looked before our appearance was altered by the benevolent poison. Laughter and moments of silence mirror the way we feel inside. I describe my pre-cancer hair: blown-dry, hot curlered, gelled, hairsprayed, and teased on top if humidity threatened to flatten it. Growing up–even as an adult–part of me thought a Southern woman’s identity was in her hair. We each have our own tabletop mirror, various samples of foundation, concealer, eye shadow, blush, powder, mascara and brow pencil. Volunteers from the American Cancer Society give us tips for applying cosmetics while dealing with the visible signs of chemotherapy treatment. I begin applying a lighter color of makeup along my jawline, blending it to match the pale color of my skin; a low red blood cell count has robbed me of rosy cheeks. Oh, my Lord. I peer into the mirror and realize that most of one eyebrow is gone. A lone misshapen eyelash, resembling a small spider’s thin leg, is dangling from a top eyelid. Short, stubby lashes on the other eye are all that remain half-way across the top and bottom lids. Brows, usually my best feature, have lost their arch. To create a natural look is a challenge. I pick up a pencil as though it were a paint brush and apply a light brown shade with gentle strokes. I call one of the volunteers over to help me. “I am afraid I’m going to mess up!” She chooses a darker brown, guides my hand with hers, and we apply it carefully, a light touch to avoid an obvious line. With only a little bit left to work with, I add as much color and beauty as possible, typical Southern woman that I am. I stored my shaved hair in a Ziplock bag and tucked it away in an old cookie tin, my treasure box, to keep it as a remembrance. Every now and then, I take the tin down from a shelf in my bedroom’s wardrobe and look at the hair that was scattered in the sink on that day when I felt bereft of femininity. I imagine someday sitting on the side of my bed next to a granddaughter with the treasure box resting on her lap. Perhaps she will lift the lid and giggle or gasp when she spies the baggie. I will tell her why I kept it, my story of hair lost, but life gained, strengthened by God, family, and friends. I will run my fingers through her baby-fine hair and hope she’ll grow into a strong woman like me. The black-and-white photo of Lisa, above, is by Cellar Door Photography, Memphis, TN. This entry was posted in Gender & Place and tagged beloved, body image, breast-cancer, chemotherapy, hair loss, hope, intimacy, strong women. Bookmark the permalink. Thank you Lisa for sharing your life–so vulnerable and welcoming. I would never wish the journey on any of us but I so appreciate your embracing of it and of your choosing to live so boldly. Thank you, dear Matilda, for reading. I am so encouraged to continue sharing my stories, and I hope my readers carry away from them something good and true. Blessings. Lisa, this was beautiful to read. So personal and so close to the bone. I want to write like you. Oh, Elena, thank you for your generous words of encouragement. I am honored that you read my piece. Blessings. Brave and beautiful! Thanks for sharing this post. Brought tears to my eyes. Jamie, thank you for reading. It makes me happy that my words touched you. Beautiful and I love your new hair do.. Thank you, Linda, for your kind words. Yes, our God was and is a very present help. It’s so sadly beautiful. What an incredible piece – the part with Tom sacred. Terry, it means so much to me that you are a reader of my pieces. Thank you, friend. That cookie tin and its contents symbolize memories your heart will never forget. I felt each word you shared with us. Thank you! Traci, I am honored you read my piece. Yes. So many memories to write and share with other cancer patients, survivors, and those who will follow me. Thank you! You invite people into your experiences so vividly, vulnerably. You laugh and cry and invite us to join you in the laughter and tears. It’s beautiful. And that image of the granddaughter yet-to-be, passing along strength through loss…wow. I’ll carry that with me. Thank you, Ann. I hope that I give all my readers something to carry with them. Spoken in words ever so tender, while showing such inner strength. You captivated that vulnerability one experiences when hair covering is no longer there. Wonderful job, Lisa. I remember this all too well. Thank you, dear Annette. The journey has been sweeter because of you. Thank you, Andrea, for reading and commenting. I want to break out in a song of Doxology for cancer-free lives! When I was bald, I’d tell my family that God has numbered the hairs on my head, and there are few left for him to count. Your words mean so much to me. All is grace. What a brave post! As a pastor I have sat with women and men losing hair ( and dignity) with chemo. As a cancer survivor of twenty plus years I understand it on a different level, and am still grieving the loss of an intergral part of my sexuality. However, we are still here. We are survivors. And those who are closest to us celebrate that….hairless or not.